Community-based adaptation (CBA) recognizes that environmental knowledge, vulnerability and resilience to climate impacts are embedded in societies and cultures. This means the focus needs to be on empowering and supporting communities to take action based on their own decision-making processes. Increased resilience to climate stresses can be achieved by enabling communities to enhance their capacity to cope with climate extremes and surprises, such as hurricanes, floods or droughts. Although CBA is an emerging area, efforts are being been made to develop participatory methodologies, raise awareness of climate change, foster adaptive capacity and measure the impacts of adaptation activities undertaken. Sharing this knowledge and experience from pilot activities amongst practitioners, policymakers, researchers, funders and the communities at risk is essential. In view of this, the First ‘International Workshop on Community Based Adaptation (CBA) to Climate Change’ was held in Dhaka, Bangladesh, in January 2005. This ninth and most recent conference was held in Nairobi, Kenya, 24-30 April 2015, in partnership with the African Centre for Technology Studies (ACTS) and hosted by the Government of Kenya. The conference theme was ‘Measuring and Enhancing Effective Adaptation’ and despite the technical theme more than 400 people from roughly 90 countries attended. Increasingly interactive sessions were run more like workshops than formal presentation-oriented formats. The resulting Nairobi Declaration on Community-Based Adaptation to Climate Change emphasised the importance of addressing the needs and interests of the poorest and most vulnerable in international agreements on sustainable development, development finance and climate change.6 This will be taken to COP21 and other key international fora by top Kenyan government officials. 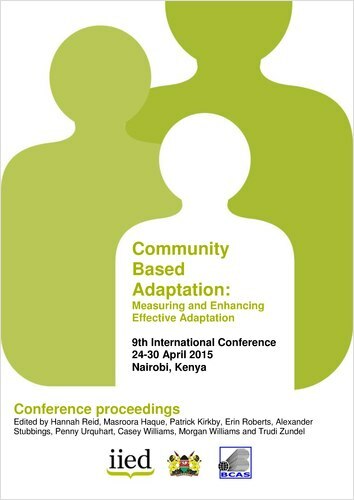 You can download the CBA9 Conference Proceedings by clicking on this link.